At Wakesurfection, we want our new boat owners to learn how to get the most of their new or second hand boats. Our boats will come with a Fresh Air Exhaust which keeps exhaust fumes away and our boats will always have an impressive ballast system which makes wakesurfing a fun experience. We will help you learn how to drive your boats and how to wakesurf. HOW DO I GET UP ON THE WAKESURF? I always get asked if your feet aren't strapped into a board, how do you get up? Watch this video to find out how. 1. 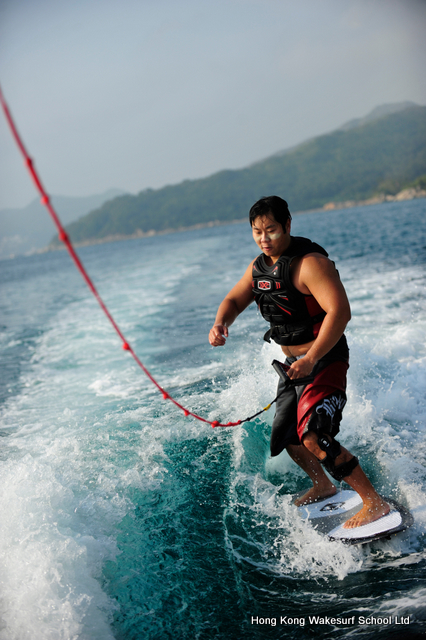 Start off in the water like you would when you wakeboard. The difference here is that your feet aren't strapped into your board. That means you need to use your feet to hold the board steady. All you need to do is bend your knees slightly and extend your feet so that as much as your feet is flat on the board as possible. Your toes should be pointing slightly horizontally. Don't forget that you are using your feet to hold the board steady, not your hands. Both hands should be holding the rope. 2. I will then give you a bit of tension so that the rope will be taught. At this point in time, you can transfer your body weight to your heels and your toesshould now been pointing vertically. This will flip the board up and it will now stick to your feet like glue. 3. I will then accelerate the boat. At this point in time, let the boat pull you up via the handle. Do not pull the handle but instead let it pull you up. 4. Stay crouched for a while. Do not get up to early. You should wait at least 5 seconds before standing upright. In this picture, you can see I'm down really low. 5. Hold onto the handle and start using your body weight to catch the wave. You should use your front foot as the accelerator and accelerate fast enough so that you are riding the wave. Don't forget to stop accelerating as you approach the boat. You'll notice the rope is quite tight here as I'm using this to keep me steady until I ride the wake. You need to put some weight on your back foot as you get close to the boat to avoid crashing into the back of the boat. 6. Once your rope is slack, as per the picture below, you know you are surfing.